Classical tour of Greece, three (3) days from 250.00 euro. Mycenae, Epidaurus, Olympia, Delphi. Our prices, combined with our presence in the travel trade since 1926, brings us at the top. 3 day Classical Tour of Greece visiting Epidaurus-Nafplion-Mycenae-Olympia-Delphi. 3 DAYS / 2 NIGHTS Dep. : 8:30 am / Ret. : 8:00 pm of the third day. April-October, organized on Mon, Tue, selected Thu, and Sat. DAY 1. 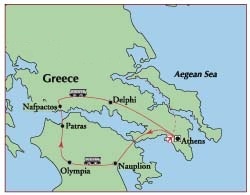 Begin the three-day classical tour of Greece at 08.45 am. Drive Southwards through the industrial city of Elefsis, home of the ancient Elefsinian Mysteries, the most important cult religion of antiquity before Christianity. After an hour's drive, you arrive at the Corinth canal. (short stop). The 6,346 m long isthmus, is one of the 4 pre 20th century, man-made waterways on earth. The canal was an old idea, when the ancient Corinthians were charging a lot of money for the ships, pulling them on greased tree trunks. The canal was finished and opened, only in 1893. Continue driving on the "Island of Pelops", the Peloponissos, and at +/- 12.00 am arrive at EPIDAURUS, known in antiquity as a healing center, the place where the god of medicine Asclepius was born and worshipped. Visit, the sanctuary of the god. The priests of the sanctuary, were excellent doctors. Psychotherapy, hydrotherapy and brain surgery were some of the treatments performed here. The sanctuary was collecting a lot of money from the people that came here to be treated. The management of the sanctuary decided to spend some of the money for the entertainment of the patients. Between 340-330 BC, they decided to assign a local architect, Polykleitos, to build a theatre. The amphitheatre of Epidaurus, famous for its remarkable acoustics and symmetrical beauty, the most perfect theatre of Ancient Greece, is a well preserved monument, still in use today during the " Summer Athens' Festival". It seems that the ancient Greeks, knew about acoustics, much more than we think, that they did. Today, thousands of people visit the area to admire its fantastic acoustics of the theatre. Drive to NAFPLION, capital of modern HELLAS (between 1828-1834), universally called, the "Grecian Venice", an old town with remarkable Venetian architecture, one of the most attractive cities in Greece. Free time for lunch. After lunch continue to MYCENAE, one of the most significant historical monuments of Greek civilization. Mycenae was the kingdom of the mighty Agamemnon, leader of the Greek army during the Trojan war. With the tour guide, visit the remains of the ancient city, see the Lions' Gate, the circle graves, the cult centre, the Palace complex on the summit of the citadel, where Agamemnon was slaughtered by his wife, Klytemnistra, and at the end, visit the treasury of Atreus (the largest and best preserved of the surviving "tholos" tombs). Excavations begun in 1841 but it was 33 years later that the German Archaeologist Heinrich Schlieman unearthed tombs, pieces of Palaces, golden jewelry and other relics that were mentioned by Homer, proving that what Homer was writing, was based on facts and was not just myths. End of the day at Olympia. Dinner and overnight. DAY 2. Spend the morning exploring the ancient site of Olympia, where the ancient ideas of unity, truce and fair play flourished. See the impressive ruins of the temples of Zeus and the temple of Hera, in front of which the Olympic flame is lighted and the torch relay starts, the Gymnasium (for training of the naked athletes), the Palestra (school and training fascilities for the wrestlers), the Leonidaion Hostel, the Workshop of the sculptor Pheidias, the Stadium where the Olympic Games were held, the beautiful aquaduct and the amazing 7 echo portico, that bounced back the echo, 7 times (another acoustics miracle), and the statues of the cheaters. (Emperor Nero was the biggest cheater of the ancient Olympic Games, taking part in the chariot races, and the guitar event that he invented. Walk across the way to the Museum and see the amazing pieces of sculpture and pottery and the architectural remains of the ancient edifices. Admire the sculpture work on the pediments of the huge temple and learn the story of King Pelops and how his cheating in the race with his father in law affected the life of King Agamemnon of Mycenae, who was his grandson. The "diamond of Olympia", the Hermes of Praxiteles, one of the most wonderful ancient statues ever made, is in a room of its own. After lunch head north to Patras and drive over the new suspension bridge which connects the Peloponissos with Continental Greece, to reach Delphi early in the evening. Dinner and overnight. DAY 3. Delphi was known as the centre of the world, the popular oracle of Apollo, who spoke to the mortals through the priestess Pythia and was known for the oblique nature of his prophecies. With the tour guide, walk up the Sacred Way of the Treasury houses to the Temple of Apollo, next to which there was the exact spot that was believed to be the navel (omphalos) of the earth, and the Theatre, with the Stadium at the top of the hill. Proceed to the museum of Delphi that houses a splendid collection of artefacts from the excavation, including the bronze Charioteer one of the best preserved ancient works of metallurgy. After lunch start the return to Athens through Arachova and arrive in Athens at +/- 19.00 and dropped either at the terminal or at your hotel.